Given that the cosmetics sector in Europe will experience a ban on animal testing to be phased in by 2009, new ways of testing cosmetics will become even more important. Not only that, but new approaches to testing can also mean reduced animal testing for medical purposes. The most recent development is an exciting one because it can allow a very quick analysis to provide assurance that a cosmetic product is safe for human use. A biochip is made up of more than one thousand human cell cultures. 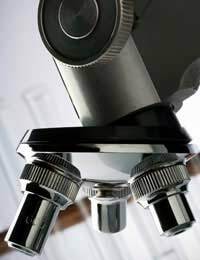 Suspended in a special three-dimensional gel and utilised on a slide to be viewed under the microscope, an individual cell culture can investigate if a specific chemical is toxic to humans. With the biochip, researchers can use this technology to find out if certain chemicals irritate the skin or cause toxicity in humans. Even more exciting news about the biochip is that scientists can add in other kinds of cells. In this way, a researcher could add in a lung cell, for instance, which would then check if the chemical is toxic to lungs. This new technology now allows for scientists to assess the toxicity of a chemical on multiple organs, rather than just skin alone. With important legislation that mandates the use of toxicity testing for drugs and metabolites in the chemical industry, the biochip will allow drug companies to quickly analyse chemicals and determine how their metabolites affect human cells. The biochip also carries other benefits such as a reasonable cost, rapid output and of course, it does not require the use of animals for testing. By addressing the issues of how a drug affects different body cells as well as how toxicity may occur once the human body metabolises the drug, the biochip is a promising alternative to animal testing. Perhaps the most beneficial aspect of a biochip is that it could eventually allow people to have a drug assessed against their precise genome prior to actually ingesting the drug. This means that if it became affordable to sequence the genes of every person, we could assess how a person will react to a certain drug. In this sense, we would be screening a drug before it is actually provided for a person, which would allow medical professionals to find the safest and most effective dose for that particular individual. While these biochips primarily look for cell death or the inhibition of cell growth, it is hoped that they may eventually test for allergic reactions and other issues relating to the use of a chemical. While this new biochip is not yet a complete replacement for animal testing, it is an exciting and positive step in the right direction for the chemical industry and pharmaceuticals. Ultimately, it pulls us a bit closer to finding a way to replace animals in laboratory testing. We would be able to use this technology to assess the safety of a new product and make predictions about chemical toxicity for different patients. The result is good news for both humans and perhaps more so, the laboratory animals that are used for testing purposes.